It helps if you can hear the soundtrack. It helps if you loved Advance Wars. It might even help if you liked listening to the Wu-Tang Clan or watched Kill Bill a decade ago and developed a love for an old martial arts movie like Shogun Assassin. These things will help, but if you don't know — or even if you do — allow me to translate Skulls of the Shogun for you. What we've got is a a video game about a dead shogun who doesn't want to wait 500 years to get his turn at rest in the afterlife. No, he's going to fight his way through his fellow dead warriors to find peace, using the kind of aggressive problem-solving that makes video games action as undiplomatic as it is interesting. The game, Skulls of the Shogun, is a thematic descendant of samurai movies filtered through the better martial arts hip-hop style of Wu-Tang producer the RZA (listen to the video here; that's in-game music. In terms of how it plays, Skulls is the child of Final Fantasy Tactics, X-Com, Advance Wars, Valkyria Chronicles and, of course, the game that spawned all of them: chess. 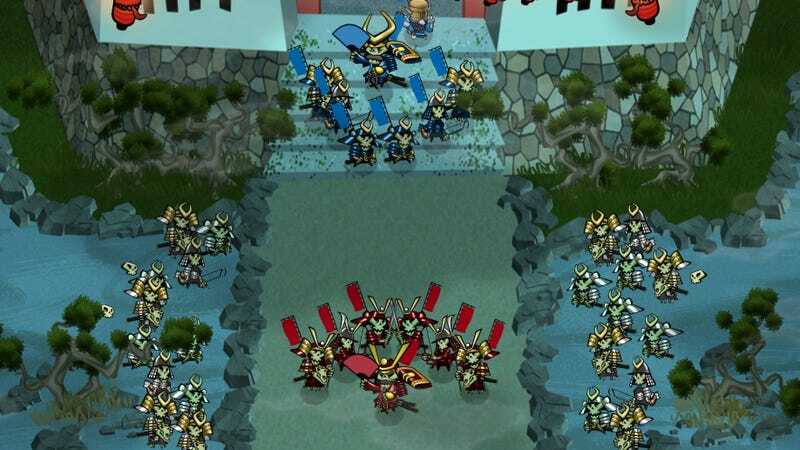 This is a turn-based strategy game with the Shogun as the prize piece, the piece whose defeat renders a match immediately lost but who, along with his fighting allies, has abilities that make him a unique combatant on the board. I saw Skulls of the Shogun last month at PAX East in Boston, where its lead creator, Jake Kazdal of Haunted Temple Studios, took me through the action. Then he e-mailed me a build of the unfinished game so I could help fill the maw in my life that's opened during the current hiatus of Advance Wars. Valkyria Chronicles hasn't done that; it doesn't play fast enough for me. In all these games, you bring a small army to battle, preparing to face off against an enemy squad, all of these units confined to a map marked with varied terrain that might affect play by, say, providing better or worse cover. The best player lets their shogun wait to join the battle, then makes him eat three fallen skulls, producing one hellraiser of unit. In each of these games, you play your turn, moving your units by some defined amount, letting any of them who can attack do so, and then waiting through the enemy's turns, watching their maneuvers and hoping that you marshaled the troops correctly. Play it well and there will be no surprises during the enemy turns. You'll know your gains and losses in your mind before you execute them on the map. These games are constrained by numbers, by the stats that define how far each unit can move and what its chances will be to win if it should attack or be attacked. Advance Wars and Final Fantasy Tactics, the great turn-based strategy series from Nintendo and Square Enix, are set on grids, the latter getting so specific that it requires you to choose which way your unit will face at the end of fulfilling its round of orders. The pace of play in these games can be methodical, though accelerated if the game's battle animations are turned off (you want this... imagine having the option to either watch a chess knight joust against a chess pawn Every Time a pawn is getting killed or just seeing the knight knock the pawn piece off the board). Valkyria Chronicles, Sega's version of this, can play more slowly, due to much more graphical pomp and circumstance, though it hides some of the off-putting math by letting characters move across the map in any natural direction, instead of channeling them from grid square to grid square. Skulls of the Shogun is a hybrid of the aforementioned games, moving with the gridless fluidity of a Valkyria Chronicles game and at the pace of an animations-off Advance Wars. For that achievement of subgenre excellence, it is welcome. In the early levels of Skulls that I played, I commanded the Shogun and his men in his first few battles of the afterlife. He moves from map node to map node, facing several skirmishes in each mission. He fights, in these early levels, beside a couple of infantry samurai, a couple of archers and some cavalry. Befitting the genre, the units have different strengths and weaknesses. Each can move in any direction you send them, but the circle that defines the limit of where the cavalry can move in a single turn is the biggest. Those guys can chew up terrain. Those mounted fighters, however, are not the potent combatants that the infantry are. But they are better in close quarters fighting than the hopeless archers who are only a menace from afar. All of the units are weaker than the shogun, who grows in power the longer you wait to unleash him. Kazdal was surprised how slowly I played it. I was paying his game a compliment. Into the old strategy formula there's an infusion of surprises. Units can form blocking walls by lining up next to each other, producing a glow around the clustered units that indicates that anyone behind them is safe. Units can knock other units back with the force of an attack, pushing an enemy either out of range or even off a cliff to sudden death. Units can haunt rice paddies to gain money for buying extra units or haunt temples to produce magic-wielding monks who heal friends or hurl fire. And then there are the skulls, which are dropped when a unit is defeated and can be eaten, powering the feeding unit up. The best player lets their shogun wait to join the battle, then makes him eat three fallen skulls, producing one hellraiser of unit who can rip the enemy apart. Ideally the enemy player — computer-controlled or one of three competing human players — hasn't prepped their shogun the same way. When Kazdal showed me the game in Boston he was surprised how slowly I played it. I was paying his game a compliment, as I'm precious with the turns I take in Advance Wars or its Nintendo cousin Fire Emblem. I savor games like these and lament their lack of prominence, even wishing against harsh reality that one would have appeared from Nintendo during the launch of their latest portable gaming system. I can wait a little longer on Nintendo, Sega and the rest of the strategy-makers because I'm optimistic that Skulls of the Shogun can satisfy my fix. The game isn't done, but it's close. Kazdal is targeting a late summer or early fall release on Xbox Live Arcade, with a Steam and Windows Phone 7 version also around that time. I'm eager for Skulls of the Shogun. If you're not, at least listen to the music (by Sam Bird and DJ Makyo). We don't just have a contender for a strong new strategy game; we've got one of 2011's best soundtracks in the making.